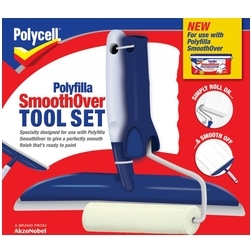 The Polyfilla SmoothOver Tool Set has been specially designed for use with Polyfilla SmoothOver, making it easy to achieve a perfectly smooth finish that is ready for painting. Ensures an even coverage and finish. Designed to smooth the surface without leaving tramlines – if there are any they can be easily sanded down once the product has dried.